Another WIP sample, started this afternoon and already mostly complete! I had a couple of requests to release the stereoscopy code from Super HYPERCUBE, but I didn't want to do that because the code was really messy. So instead I'm redoing a proper sample with most of the techniques I used in sHC, plus a couple of other experiments. The last point is what I'm still working on but it's nearly finished. The idea is to make a depth pass before rendering each eye, and use the depth information of what's close to the center of the screen to know where each eye should look at. Keeping eyes parallel is simpler and works, but it's not realistic, since both eyes are hooked at a single brain that wants to focus at one point only! After that I'd love to try and add depth-of-field to it so that objects wildly out-of-focus don't hurt the eyes so much. Sooo... I'm trying to implement depth-of-field based on this paper, it's proving a little more difficult than I thought. Not much to show as it doesn't really work right now. Edit : Ah what the hell, here's where I'm at. This allows me to get the distances of the nearest and farthest "focused" plane distances based on many physical lens and camera settings. What "focused" means is defined by the Circle-of-Confusion parameter. One big problem that I just found is that I'm going to have to do DoF for each eye, separately. And render depths twice. I can't use a single post-process DoF shader because the depth buffer of a single "cyclops" eye doesn't match any of the eyes' depth buffers, and it causes discontinuities that really don't look natural. I'm not sure if this is going to be too slow. It means a lot of sampling. We'll see. Why do you use light blue cyan and red instead of green and red btw? Chromatically opposite colors must be used. Cyan vs red is the current norm. Green would go with magenta I believe. Yup! (1, 0, 0) for an eye, (0, 1, 1) for the other. But since that way the left eye recieves half as much light as the other one, I use gamma correction to compensate, which makes the overall image look reddish. Why dont you just do (1,0,0) vs (0,0.5, 0.5) ? Using DOF with this sounds pretty complicated. Nice work, as usual... I only wish I had one of those blue/red glasses, they seem to be so hard to come by since the 80s ended such a long time ago. TV3D 6.5 Community Docs - Read, use and please contribute! 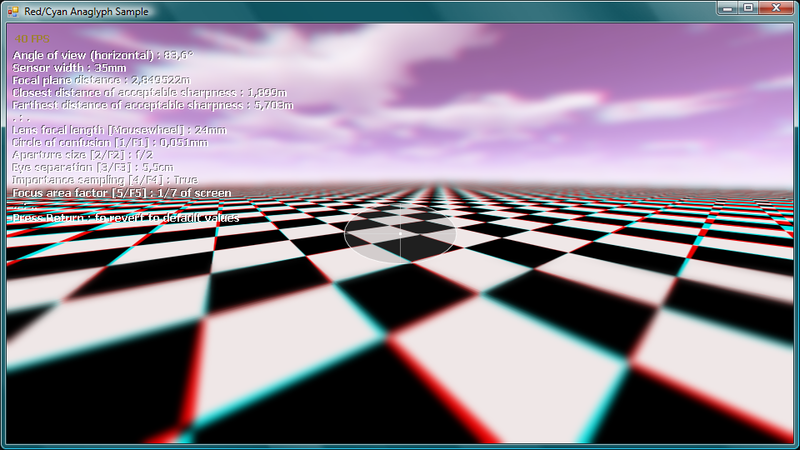 Stereoscopy + two-eye DOF is still ways off, but "cyclops" one-eye depth of field alone is looking good now. ...at least from some selected angles. I've also been adding real camera controls because it fit with the formulas I'm using for "near focus plane" and "far focus plane" calculation. The "focal length" parameter actually changes the field-of-view angle based on physical calculations, which is cool. But it also assumes wierd things like that I'm viewing the image on a 35mm full-frame print... there is no actual "sensor size" when you're viewing on a screen. 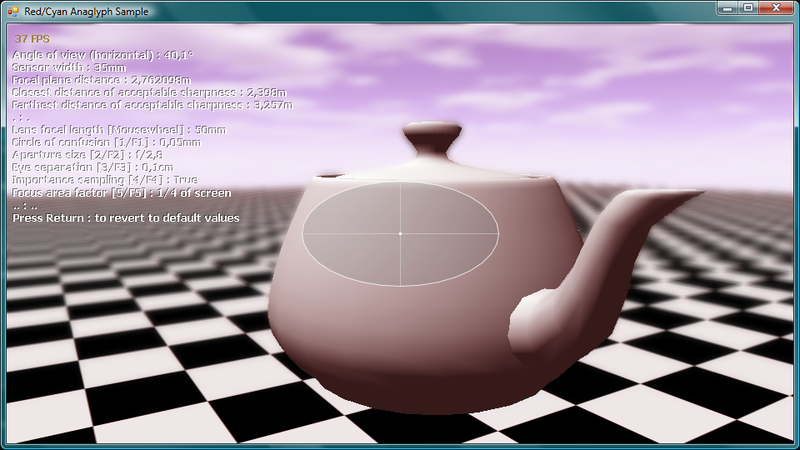 Edit : A view of the checkboard with eye separation to show how it works together when there's no depth difference between the two eyes and the "middle eye" that I use for depth sampling. Awesome... Actually I was planning on trying this today, opened my browser to check form discussions and here's your discussion. Red/cyan anaglyphs stereoscopy as-is is simpler than what I'm trying to achieve... If you know what point or distance you're focusing on at all times (for example if your camera orbits around a point), it's a lot simpler. What's making it hard for me is making a full first-person camera with stereoscopy, and trying to put in depth-of-field on top to make it look cool. 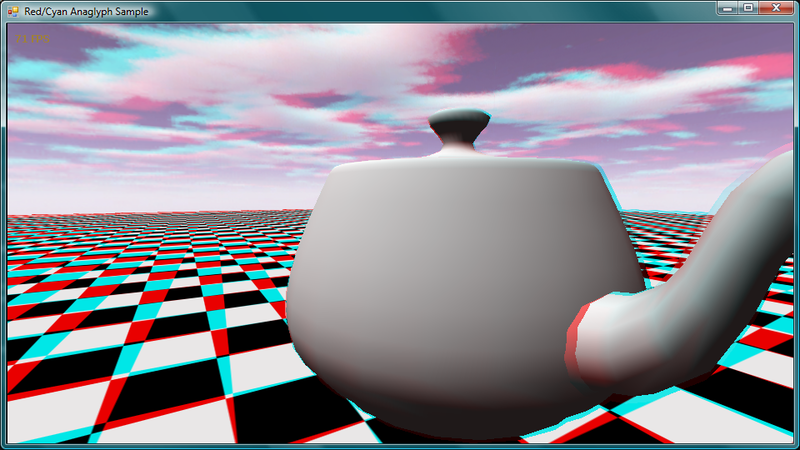 I have to create a anaglyph filters demo before end of this month (september). 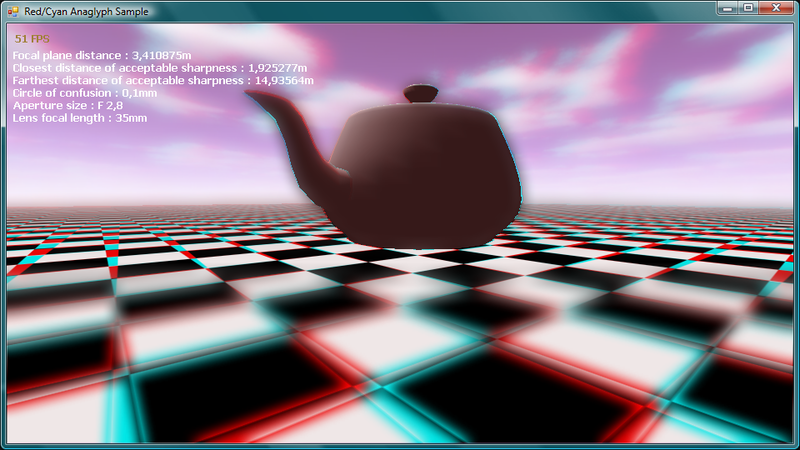 I did take a look at the interesting anaglyph filters website link you referenced to but... I still need some basic idea on how to use it. Should I render what the left eye should see and then multiply the rgb by the filter color? (Lerp) and then do the same for the "right eye view". Please help... I don't need depth of field. Ha! Just yesterday I was thinking about releasing that sample without the depth-of-field part (which is too much trouble for me right now). So I'll do that soon. My implementation uses two surfaces, one for each eye, and a shader to combine them (using the matrix filters) onto the main buffer.